Our product range includes a wide range of cyanoacrylate adhesive, medium viscosity cyanoacrylate adhesive, high viscosity cyanoacrylate instant glue and gel cyanoacrylate adhesive (no drip) instant glue. Packaging Size 10gm., 15gm., 20gm., 50gm., 250gm., 20kg. 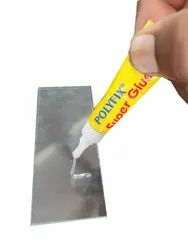 POLYFIX cyanoacrylate adhesive is low viscosity ethyl based cyanoacrylate adhesive is a single component adhesive for multiple industrial uses like flex in signboard Industry, footwear, wooden application in furniture industry, awning industry, ceramic industry, handicraft, automobile, marbles, toys industry. Offering a complete range choice of products with different grades according to the requirement of industry. The glue is Instant in Curing and is Solvent Free. Single Component Instant Glue are quick and easy to apply and do not require any mixing or heating before the use. In order to achieve higher performance, only application of contact pressure is required. POLYFIX ® Adhesive adheres and delivers best performance when applied as a thin film between two surface. Especially designed round and flat bottles. Extension nozzles for controlling the amount of adhesive to be used. 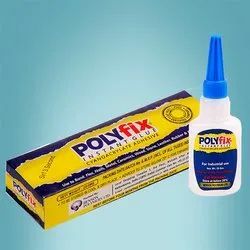 POLYFIX Medium Viscosity ethyl based CA Adhesive (cyanoacrylate) is a high quality product for porous surfaces where requirement of application is to form glue drop on application area. Also applications where minor gap filling is required. Minor gap-filling CA adhesive has a viscosity ranging to 50-100 cps, Its appearance is like a syrup. This grade of glue is perfect for gluing absorbent surfaces or materials and pieces which have minor or slight gaps between them. It cures at a slower speed about 30-60 seconds but May variate depending on climatic conditions. You can bond wooden objects, MDF, metal, rubber, nitrile, ceramics and certain plastics, stone etc. It is simple to use. To bond two parts together hold and apply the CA glue to one surface and keep and press other part on it, then keep pressing tightly for about 60 seconds. Glue will stick. Note final strength of glue can only be obtained up to 24 hours. Applications: Guitars and other musical instruments, furniture, marble handicrafts, plastic toys, model making, lampshade, screen printing frame, auto stereo systems, trophies, car and airplane interiors, high-end jewellery, model-building. Usage/Application Use for Bonding Ceramic, Wood, Handicraft, Marble, Granite etc. POLYFIX ® Cyanoacrylate adhesive is ethyl based high viscosity grade (800 to 1200 cps). Its appearance is like honey and it is one-part solvent-free adhesives that cures at room temperature and offer strong bonding power. Instant adhesives are currently used in porous surfaces for a wide range of applications, both in industry and in the home uses. 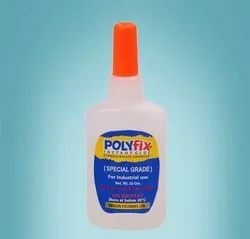 POLYFIX ® High Viscosity Cyanoacrylate Adhesive is Ideal for vertical bonding or porous materials or when neat and clean work is needed adhesive flow is crucial. It Offers maximum gap filling and repositioning time. · Extra working time to reposition surfaces than instant cure. · Can be used to fill gaps up to certain limits. · The high viscosity allows bonding on vertical surfaces without runs or drips. · Fixing of various components or pieces on printed circuit boards and lead wires. · Pasting and patching of parts for automobiles and machinery. · Making of hobby crafts such as plastic/clay models. · Fixing for Plastic and Iron studs on roads (cat’s eye/ road marker) . · Best suitable for metal, rubber, plastic, wood, pottery in the fields of every day household repairing, arts/ craft making and home repairing, etc. The Surfaces to be bonded should be clean from dirt/oil, moisture. Dispense glue one surface and clamp another surface to it and press tightly. Apply only enough glue to leave a thin film layer after compression. hold together and grip firmly for 1 0r 2 minutes. Good contact is essential. An adequate bond develops in less than two minute( may variate depending on variety of surfaces and humidity in weather) maximum strength is attained within 24 hours. Wipe off excess adhesive from the top of the bottle and recap it properly. Cyanoacrylate products if left uncapped may deteriorate by contamination from moisture present in the air. Cyanoacrylate products may be cured by dust and moisture already present in air and polymerise, whitening may appear on the surface of the container or the bonded materials. Should this happen, wipe surfaces well with acetone. Note- To enhance shelf life store glue bottle below 20 degree. · 250 Gram plastic bottles. · 50 Gram plastic bottles. POLYFIX ® Cyanoacrylate adhesive is ethyl based Gel grade. Its appearance is like jelly and it does not drip while usage and it is one-part solvent-free adhesives that cures at room temperature and offer strong bonding power. This Instant adhesive are currently used in porous surfaces or uneven surfaces for a wide range of applications, both in industry and in the home this gel is used. POLYFIX ® Gel Cyanoacrylate Adhesive is Ideal for vertical bonding, uneven, round or porous surfaces or where neat and clean work is needed adhesive flow is crucial. It Offers maximum gap filling and repositioning time. · Can be used to fill gaps. · The Gel allows bonding on vertical surfaces without runs or drips. · Based on DIY concept. · Fixing for stones and fancy plastic parts on hair clips etc .